The first thing I notice about the iPad is that it’s wicked fast. Everything happens in a snap. Apps fly open. They close even faster. Web surfing is lickety-split, especially on a fast Wi-Fi connection. 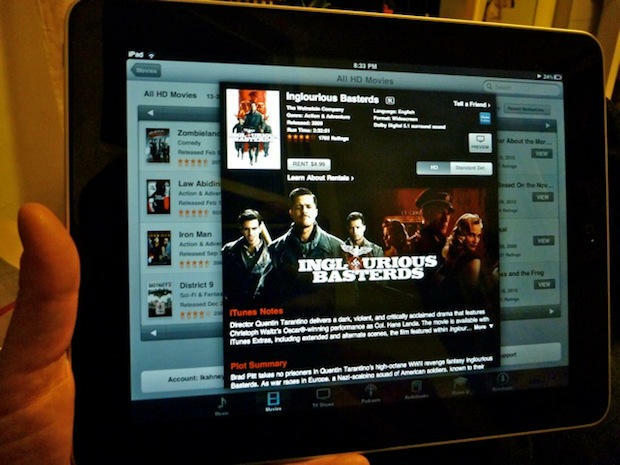 Netflix movies load almost immediately, and scrubbing through them is quick and painless. I marvel at how seamless it is. Turning the pages of Winnie The Pooh is so gorgeous, I spend five minutes just turning and returning the pages. Some new email comes in. Everything’s synced: email, address book, calendars, music and movies — all thanks to a two-minute setup in iTunes. I dash off a quick reply, and am pleased how easy it is to type on this thing. Woah — this is one slick gadget! I know what you’re thinking. Should I get one for the kids instead of a nasty netbook? Can we replace our old PowerBook with it? Should I take it to a confernece next month instead of my heavy MacBook? For easing reading, here’s CoM’s review in an easy-to-read Q&A format with lots of pix. My colleague, Jose Gutierrez, contributed several sections, including the app reviews. Is it well-built? What’s the quality like? The iPad is a beautifully-made product. The aluminum and glass construction is top notch. It’s tough and durable. I haven’t thrown it on the floor of course, but it feels like it’ll take some lumps. As iFixit noted in a teardown, the chips are superglued to the motherboard. It’s no featherweight. 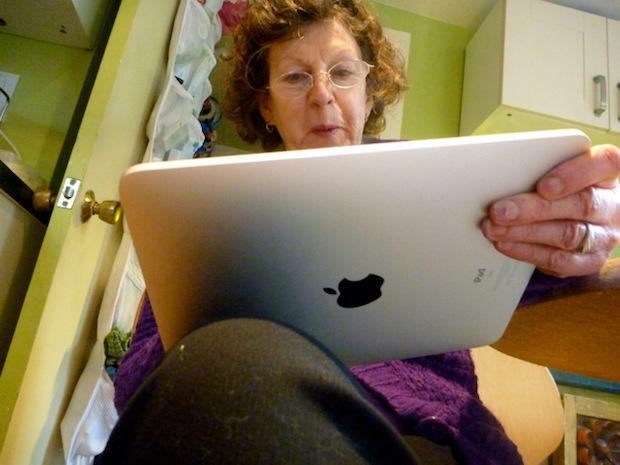 Weighing 1.5lbs, the iPad has got some heft. In fact, it borders on heavy, especially if you’re holding it in one hand for any length of time. It’s definitely a gadget that benefits from an arm or leg rest. And the glass screen makes it top heavy, especially when typing it portrait mode. The 9.7-inch screen is really bright and beautiful. It has a resolution of 1024 x 768, and great viewing angles. However, the glossy finish can cause reflection issues. It’s got seriously great battery life. 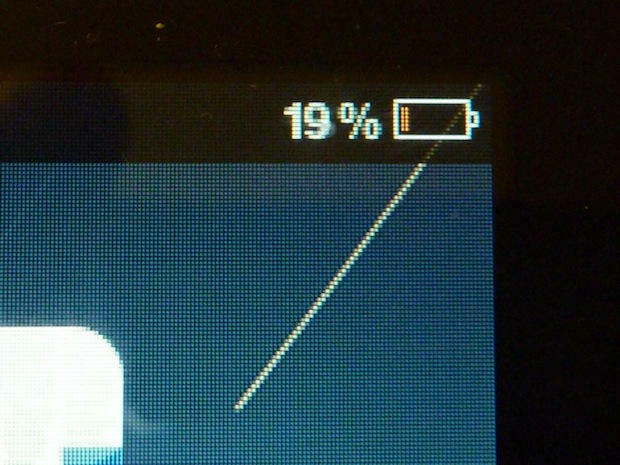 We bashed on the iPad all day — a full 12 hours of more or less non-stop usage — and it’s still got 17% charge. When hibernating it loses charge at a very slow trickle. Very fast. Everything flies. Even slow-poke apps like Google Maps and Google Earth have almost no lag. But where’s the USB and SD Card slots? My wife is incredulous it doesn’t have a SD Card slot for her camera. What’s the point of having it if you can’t upload photos to it she says? She’s got a good point. There is an adapter but the lack of slots serves as a reminder that this first version isn’t yet a laptop/desktop replacement. It’s OK for hunting and pecking, but the keyboard needs work. It’s difficult to type in portrait mode. 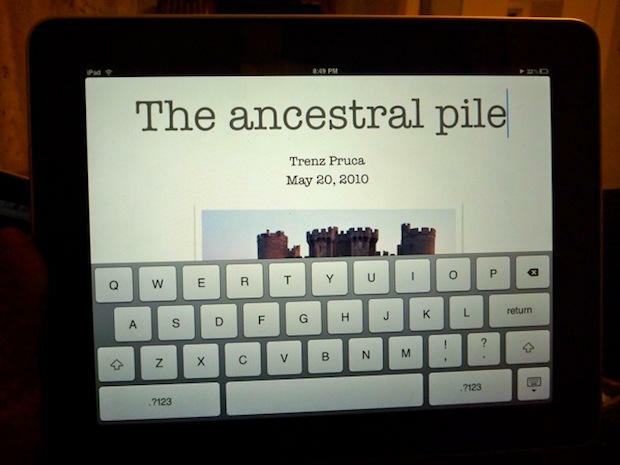 In landscape the keyboard dominates the screen. Typing might be a deal breaker for some, but as this video shows, it is possible to type quickly. Can you work on it? Yes and no. You can make spreadsheets in Numbers and write in Pages, but the biggest hitch is the inability to export iWork files using standard Microsoft Office file extensions. This is a big setback if any work environment where everybody else uses Windows, which is most of the working world. Also, I think the keyboard will prevent users from using iWork on iPad for creating files. Without the optional keyboard, it’s better suited to light editing and twaeking files made on other machines. 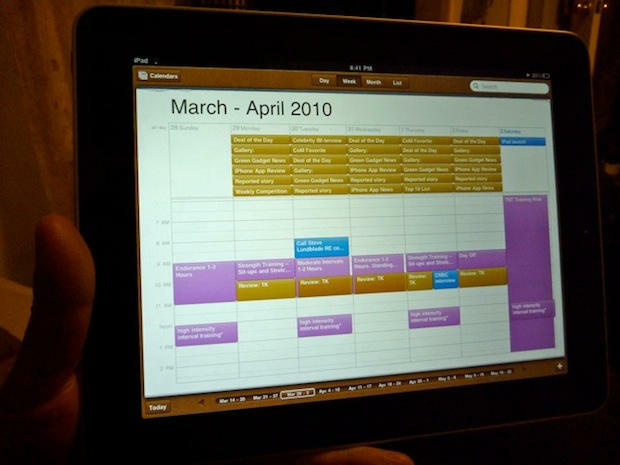 Until Microsoft Office comes to the iPad, it will not be taken seriously by corporate America. Maybe Microsoft Office for the Web will fill this gap? Does it work out of the box? Unfortunately no. 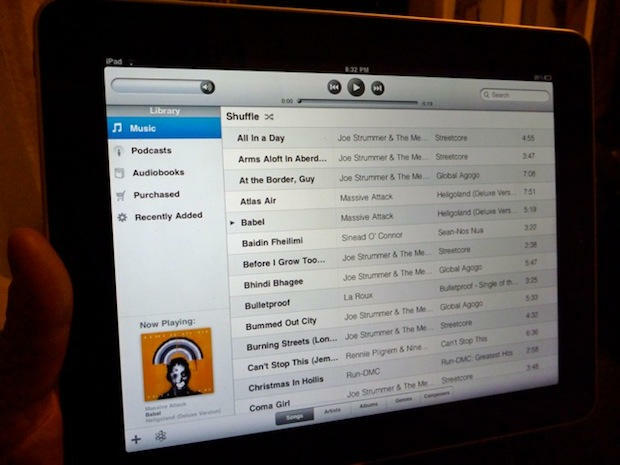 You must initially set up the iPad through iTunes on a tethered computer. For some, this is a big disappointment. 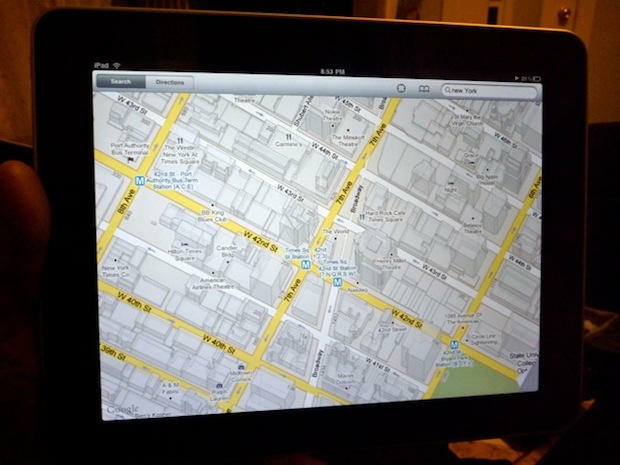 It shows the iPad isn’t yet a PC replacement but a complementary product. 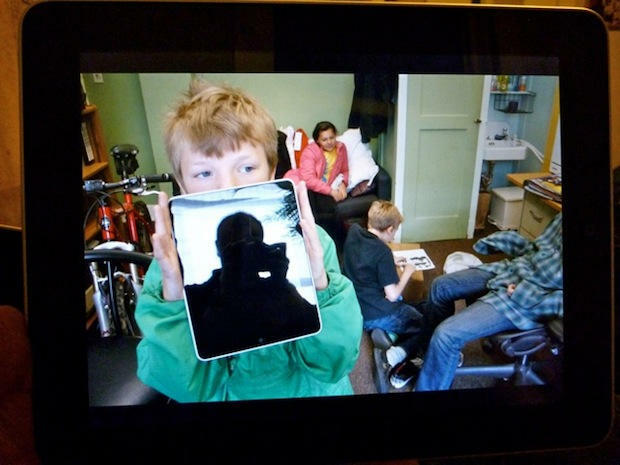 Can you print on the iPad? Printing isn’t built in but you can print with third-party apps like ActivePrint. Is the absence of multitasking a problem? Because apps return to the same state you left them when you quit, the lack of multitasking isn’t such a huge problem. Plus, third party multi-tasking will come probably with iPhone OS 4.0. What about the lack of Flash? 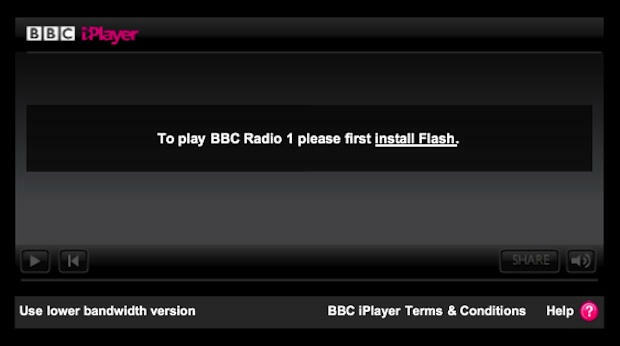 The lack of Flash is definitely a pain point. One of the first sites we visited (the BBC for the Cambridge/Oxford boat race report) had no video. But Flash is a dying technology. Its only saving grace is Hulu. What’s the set-up process like? Initial set-up was easy but the sync process was slower than expected. It took forever and I thought it had crashed. However, after about 40 minutes it had transfered 30GBs of music, movies, TV shows and apps, plus all my contacts, calendars, a couple of photo galleries and so on. Syncing is now set to happen automatically via MobileMe. How is it watching movies in your lap? The Netflix app for iPad looks just like the website, which is awesome. No need to learn a new way to do things. Not only can you stream content, you can reorder your queue through the app. Streaming is super fast (of course this depends on your WI-FI connection) and very smooth. I used Angels and Demons for this quick test. 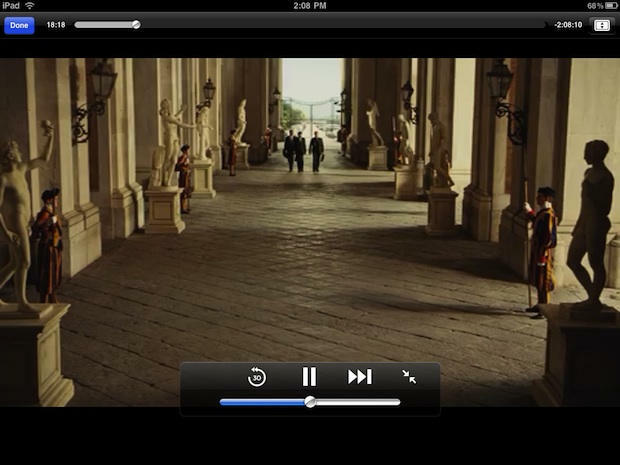 This app acts just like the website version of the Netflix Player. Bravo Zulu to Netflix for this awesome app. Now get hot on a version for the iPhone! Is it really as great as they say for reading newspapers? The NY Times Editors Choice app is very easy to navigate and of course features content from some of the best journalists in the world. 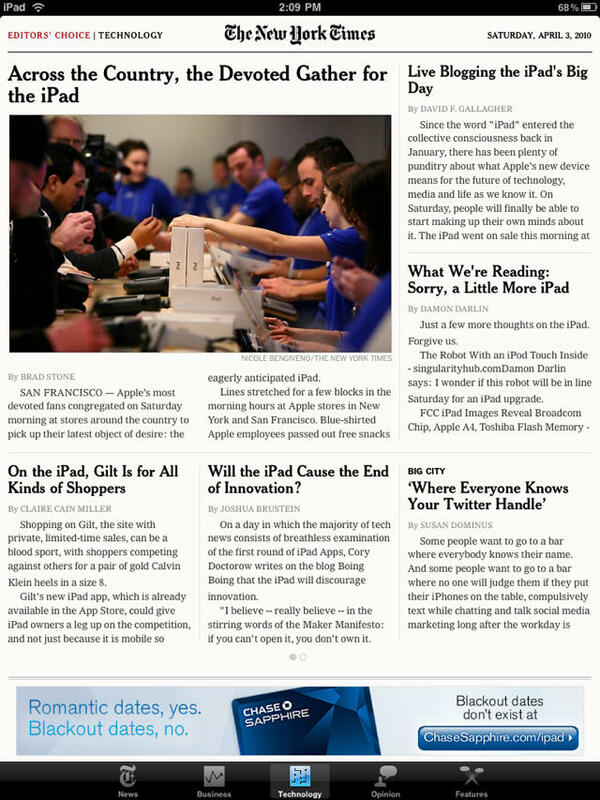 This particular NY Times app shows the promise of the NY Times in the iPad format. 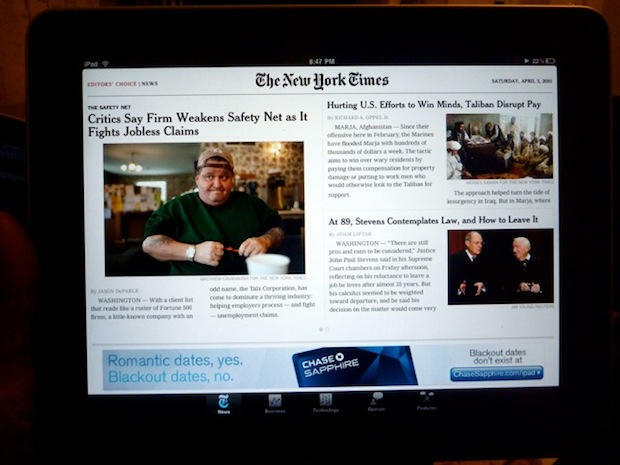 However, it’s quite disappointing that the NY Times isn’t ready to handle a subscription-based app — especially after their awesome showcase at the iPad keynote address. Let’s hope they learn from the mistakes the Wall Street Journal is making in pricing their online version higher than their print version. If I could get the full daily edition at a rate of about $10 a month, they would have another subscriber for life (or at least the life of the iPad). 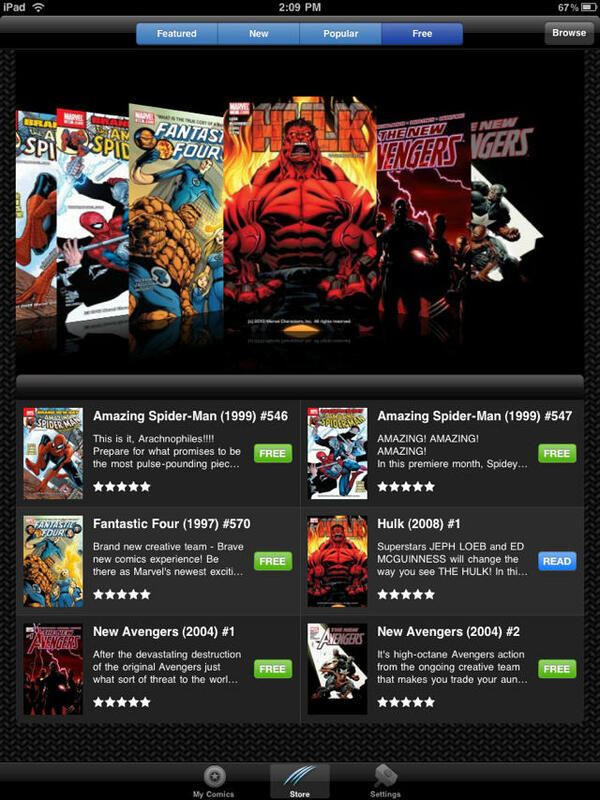 I have not purchased comics since I was in middle school but had to check out the Marvel Comics app. I downloaded some of the free comics to try it out. Not blown away but it is an ideal way to read comics, as long as you are not into the collecting community and want to just “read” the comics. I hope comics stick around — but the end of the age of comic collecting may be upon us. How buggy are the apps? Some apps still have bugs due to lack of hardware availability to developers. Simulators can only do so much. Expect a firmware upgrade soon as well as many app updates. The lack of simple weather, calculator and stock apps is a shame. Sure, there are 3rd party apps for that, but Apple seems to have glossed over some of these details. Isn’t the iPad locked down? Can you customize it? I just loved being able to customize the wallpaper of the iPad. Just one more way to show that this one is mine. Being able to put six apps in the dock is awesome. Many features like this and the custom wallpaper need to make it to the iPhone. Is it good for games? Heck, yeah. It’s awesome for games. 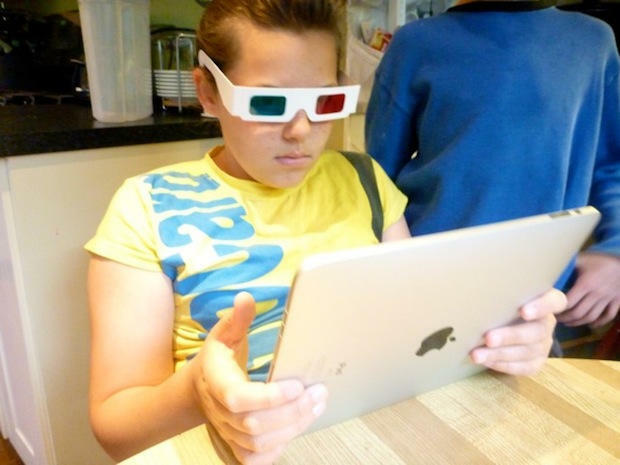 The kids fought tooth and nail about who got to play with the iPad, especially Flight Control HD (in 3D). We eventually had to take it away. 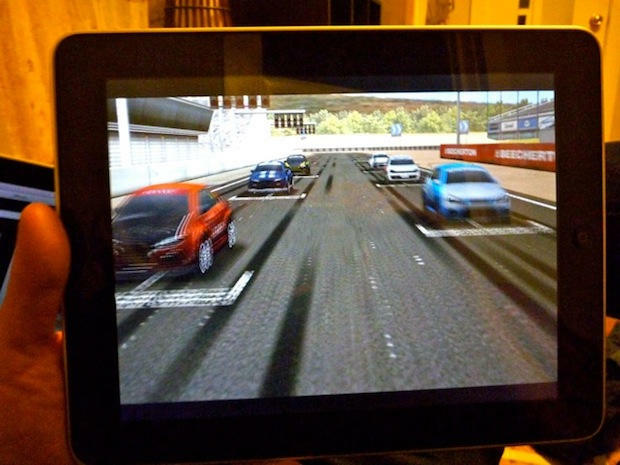 The bigger screen make it much better for gaming than the iPhone or iPod touch. For a start, your fingers don’t get in the way as much. The accelerometer works great as a control mechanism. 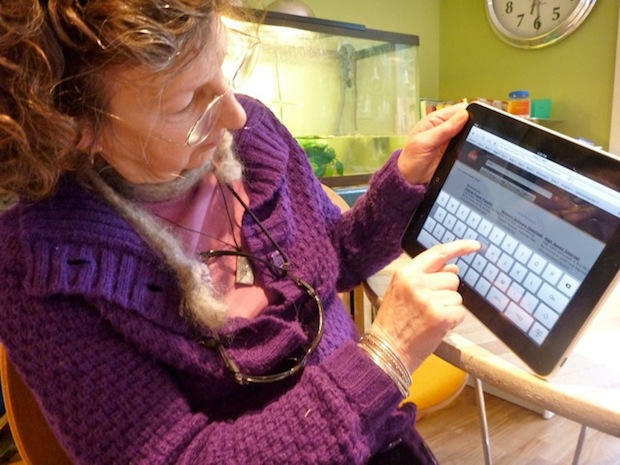 It might be good for kids, but what about the older generation? We had to take it away from my mother too. Does the screen get all greasy? Oh yeah. But it cleans up easily with a good wipe of your t-shirt. What’s the email app like? The email app is well-designed. The emphasis is on the message bodies rather than subject lines, a good design choice that makes it very easy to read quickly and efficiently. Typing a lengthy email on your lap is surprisingly efficient. I’m a piss poor typist and make a lot of mistakes. But if I just power on, the system’s autocorrection takes care of most typos and missing punctuation. Web surfing is awesome. Mobile Safari is super quick. The bookmarks bar is very nice. 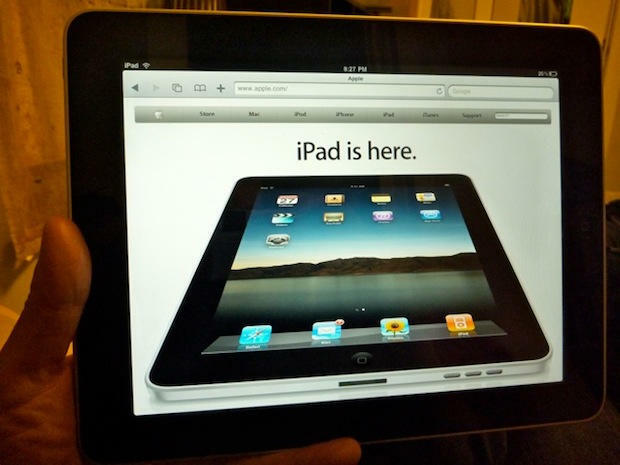 Web browsing is one of the main reasons many people will buy an iPad. Safari for iPad is designed for quick and easy browsing whether your are on a ferry headed to Seattle or are sitting at home on your couch. Sites load up very quickly and new tabs open instantly. While visiting many tech blogs, I noticed that it was very easy to read the text even without zooming in to the two left columns as most blogs have a three column layout. It will be interesting if Apple approves the Opera Mini browser for the iPhone OS as that will open up a whole new way to browse on the iPad. How is it as an iPod? The iPod layout is very clear and useable. Again, the bigger screen makes it much easier to navigate than an iPhone. 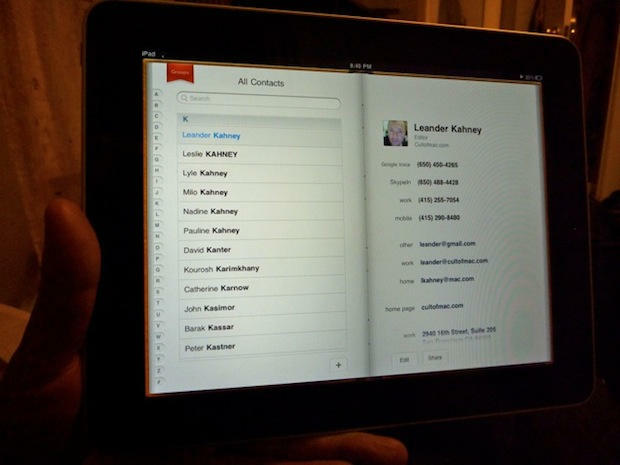 Setting up your email, contacts and calendar is as easy as it is on the iPhone. 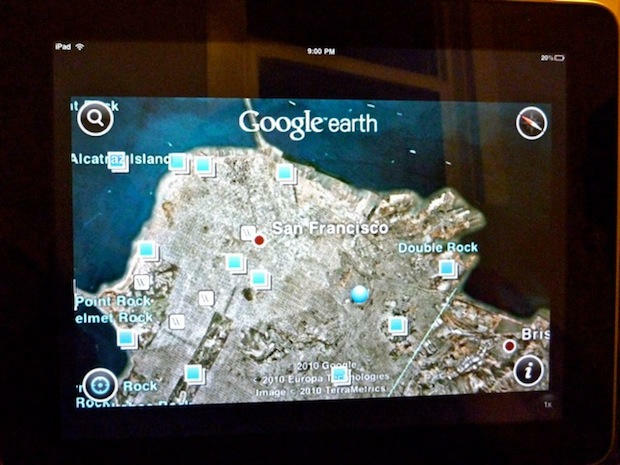 A note to Google users: Google Sync is not supported on the iPad. At least, that’s what it says when you visit m.google.com/sync on Safari on your iPad. However, if you then go visit that same site on an iPhone after you try it on the iPad you will see iPad as one of your devices. Strange! Google Contacts works great as well as Gmail through the Mail app or through Safari. The calendar is gorgeous in the week or day format. What does the App Store look like? Apple needs to work on the iPad App Store in iTunes too make it blindingly obvious what apps are for what device. 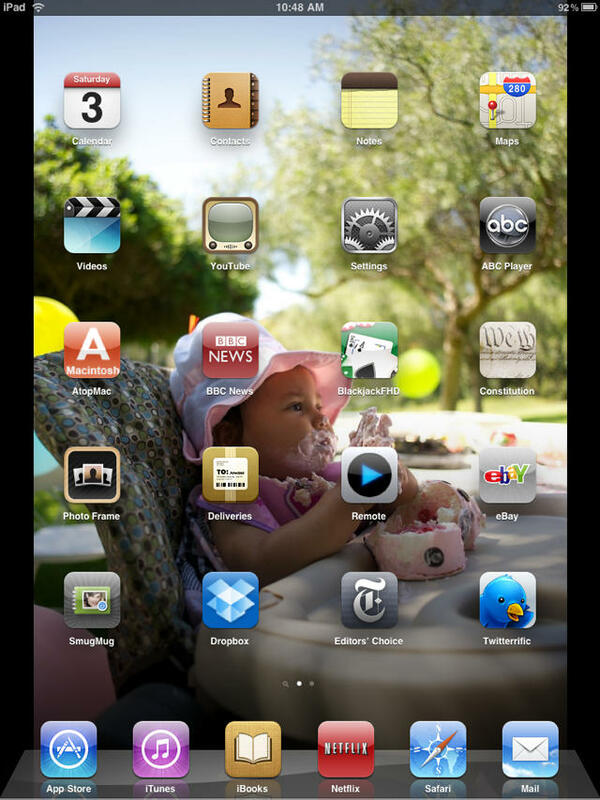 At the moment, it’s not easy to see what apps for the iPad and what are for the iPhone. A simple tab called “iPad App Store” in iTunes would solve this problem. Browsing the App Store on the iPad is not as clean as I thought it would be. Loading more titles in the top paid or top free apps is clunky and in need of a Coverflow-style scrolling option. 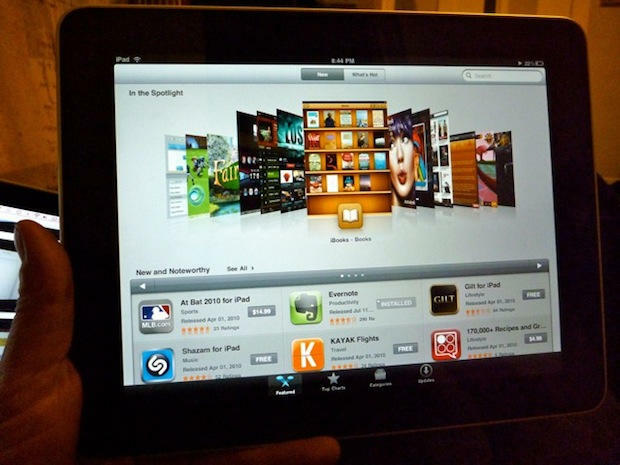 You cannot simply just look at a page of the top paid iPad apps. You have to look at the top paid and top free iPad apps side-by-side, which makes for constant scrolling. I would hate to have an app at the bottom of the list — it takes a lot of scrolling for users to see your app. But should I buy one? 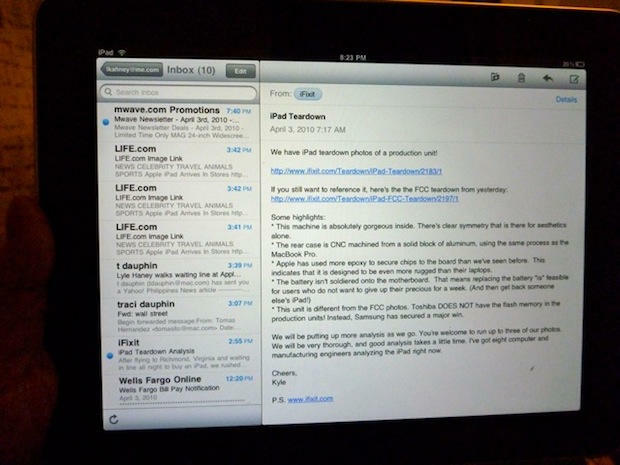 The iPad is a good product that will become an awesome product when more apps are written and optimized for it. A firmware update is needed to work out some bugs. At the moment it’s perfect for relaxing at home or on a plane. It’s not quite ready for the working world. The iWork suite just not quite good enough. But that soon too will change. 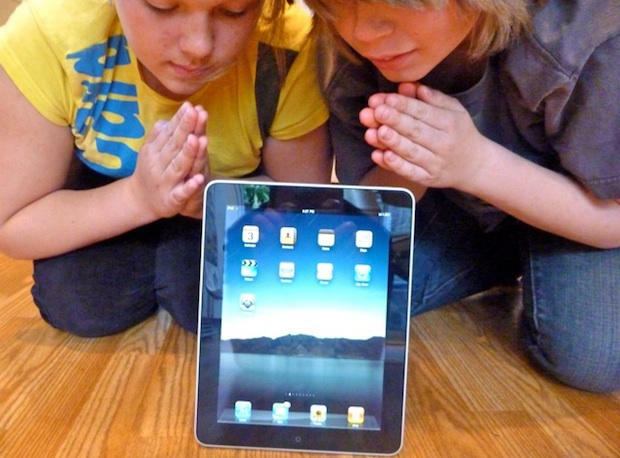 Version of two of the iPad will be much better, but why wait? We say experience the future now.